Grease muffin tins; I use my fingers to smear the fat evenly throughout the cups. Melt 1T. fat in a saute pan, over medium-high heat. Add the pork and brown; breaking up the meat throughout the process. Add chopped broccoli rabe and seasoning and toss to combine. Set aside to cool slightly. While meat is browning, break eggs into a blender (or bowl), add chive oil, salt, and seasoning. Blend until whipped and slightly frothy (about 15 seconds). Transfer meat-veggie mixture to the muffin cups, evenly distributing the mix. Pour egg mixture over the meat-veggie mixture until filled to the top*. Transfer the muffin tin to the preheated oven and bake until puffed, about 20-30 minutes. 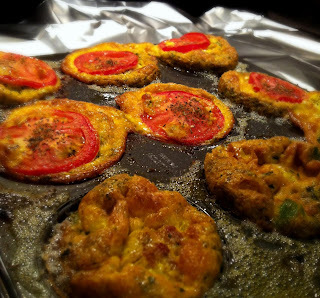 *I added slices of tomato (sprinkled with additional Tuscan Seasoning and sea salt) to the tops of my frittatas, prior to baking. These sound delicious... can't wait to make 'em! this looks yummy. got to try it. well,post to read and learn.